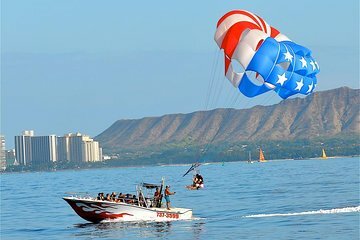 Vuele a 500 pies (152 metros) sobre la pintoresca costa de Oahu en esta aventura en parasailing de 1 hora desde Waikiki. Abróchate a un arnés y despega del bote, volando sobre la costa sur de las islas para obtener vistas espectaculares. Los paquetes de fotos y las imágenes de GoPro están disponibles para su compra. No se necesita experiencia; Esta actividad es adecuada para participantes de todos los niveles de experiencia. A bit disorganized since the beginning. I received numerous e-mails from the day I booked until the day of the tour. On the actual day, I had so many mixed informations, I wasn't sure what time I had to be there. Finally got someone on the phone who confirmed everything. We went, it was ok, nothing exceptional. We were expecting more. When I came out of the boat they told me I had to pay extra, because I had requested the 1000ft instead of 500ft. I told them we, the passengers, were actually discussing about it during the ride because they didn't seem to have control over the time that people were in the air. So some were there longer than others. And the crew never asked anyone's names, we didn't seat on any specific order. How did they know who paid for what? When I mentioned that to the guy that was charging me for the extra, he sai he would confirm with the captain. The captain then came in my direction asking in a rude manner Do we have any problem here? It was my honeymoon, and it was a cold day. I didn't want to make a big deal over 70.00 so I said we didn't have any problem and I paid the extra but I felt very uncomfortable with the situation. They should have handled it in a different way. While the experience itself was fun and relaxing and the guides were professional, it was shorter than expected, and we didn't go as high. We also were told that we could add height with the purchase of a photo package. We also didn't receive confirmation from the company about pick up, which was fine because we were close and had a car but it was a tad frustrating. Recommend parasailing but ask more questions about flight times. everything was awesome pickup and drop off was on schedule and 2 man crew was great!